Marvel's Daredevil follows Matt Murdock, attorney by day and vigilante by night. Blinded in an accident as a child, Murdock uses his heightened senses as Daredevil, fighting crime on the streets of New York after the sun goes down. His efforts are not welcomed by powerful businessman Wilson Fisk - aka Kingpin - and others whose interests collide with those of Daredevil. Though Murdock's day job portrays a man who believes in the criminal justice system, his alter ego suggests otherwise, as he takes the law into his own hands to protect his Hell's Kitchen neighborhood and the surrounding communities. Taking a cue from Frank Miller and John Romita Jr's Man Without Fear miniseries, Daredevil started Matt out in a solid black outfit with an eyeless half-mask (which, not coincidentally, also serves as a reference to the character's first live-action appearance, in The Trial of the Incredible Hulk). The figure is matte black, with gloss reserved for the hands, boots and belt. Grey highlights on his chest keep him from looking unpainted. His mask is a new piece, with long ties in the back and a bit of hair peeking out. His billy clubs are light tan, and fit (very tightly) in the holster on his right leg. The front of the box claims it comes "with interchangeable parts! ", and that's true: there are extra bits (chest, coat, tie, hands) to turn Daredevil back into Matt Murdock. Explains why they went with the black outfit, eh? To complete the look, he's got a briefcase and a cane. 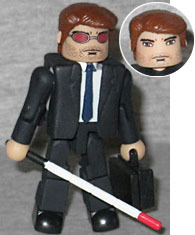 Just one cane, though; if you've seen the first season, you'll know that Matt Murdock must spend more on canes than most people spend on rent, just littering the alleyways of New York with the things as he throws them away willy-nilly. You have your choice of two civilian heads as well: one with glasses, one without. And of course, both are very stubbly. 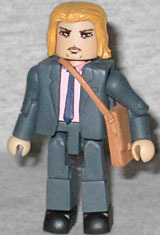 Until now, the closest we've gotten to a Foggy Nelson toy is Happy Hogan. Other than severely needing a haircut, Elden Henson is great as the character, displaying his loyalty to his friend and his skill with the law (there's a reason that his name goes first on their law firm, and it's not because Matt is humble). He's wearing the same suit as his partner, though his is dark grey and he has a pink shirt underneath. A pink shirt and a blue tie? Such fashion sense he has! His satchel is slung over his shoulder, and his hair grazes his collar. Wilson Fisk is a large, intimidating man, so getting Vincent D'Onofrio to play him was good casting. He doesn't wear his traditional white suit in the show, because he isn't really The Kingpin yet. 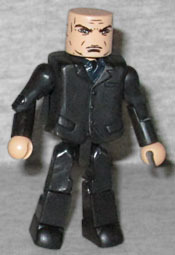 The Minimate gets a waist extender, to make him taller than the other figures, and a new chest cap for his coat and shirt - he doesn't wear a tie, and all the previous suit jackets have included one. The frown on his face is suitably rough. The only thing we're really missing are some paint apps on his forearms, to create the cufflinks that meant so much to him. 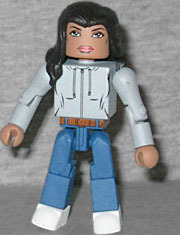 Rosario Dawson gets her second Minimate as Claire Temple. Night Nurse serves as the Phil Coulson of the Netflix shows, the thread tying everything together. She's wearing jeans, a gray hoodie, and white shoes. Her hair falls down over her right shoulder, meaning she can't turn her head very far. This is her "rooftop interrogation" outfit, so to help protect her identity, she has an alternate head featuring her homemade mask with the creepy eyes cut out. 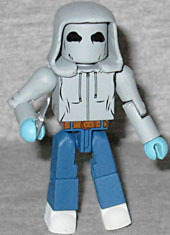 She also has the same hood as Spider-Gwen, but remolded to remove the web pattern. There's an extra set of blue hands (medical gloves), and a little knife. For stabbing. We may still be waiting for Hasbro to get on the Netflix ball, but Diamond Select is already giving these excellent shows representation. 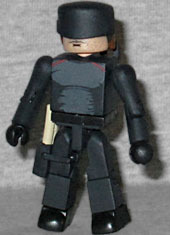 This entry was posted in Art Asylum, Marvel, MMMR and tagged Daredevil, Minimates. Bookmark the permalink.